I’m so proud of my boys. I’ve always tried to encourage their creative sides, and they haven’t let me down. My five-year-old is an obsessive sketcher (as I have mentioned before). My eleven-year-old is fascinated by media of all sorts, and has a knack for working computers. So my fiver drew one of his typical pictures, filled with complex robots and (inexplicably) an elevator in which are riding me, him, and my niece. I just recently bought my elevener a used copy of Flash 5 on eBay, which he has learned with astonishing ease (“No, Dad, you need a keyframe there. Click the frame after that one, then select Insert - Keyframe, ...”!!!). At my suggestion, the drawing was scanned and animated. The older did an admirable job injecting motion into the drawing, and the younger coached him about his original intent, where it was not clear in the drawing (“No, that’s an eye that goes back and forth! Make the gears go around!”). I’ll say it again: I’m so proud of my boys. That's pretty slick! I have a 6 year old son and a 9 year old daughter. They're both very good with the computer, but I definitely want to get them more involved in creative activities. Sarah likes to make movies of her barbies and edit them on the computer, while Matthew prefers to play games. Wish that I could do thangs like that when I was that age.That's cool I would be proud also. Wow, the drawings and animation are great! I was searching for something else altogether when I found your page. 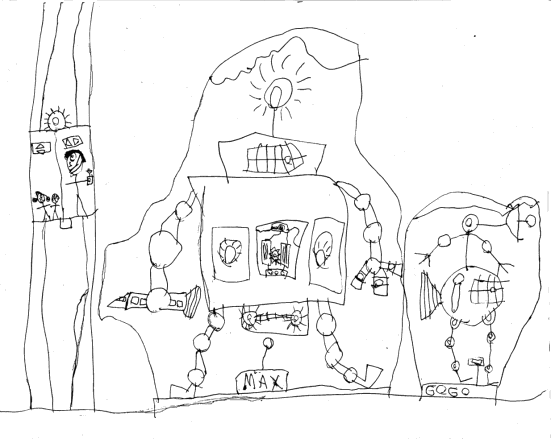 Your son's drawing remind me of my own "robot" drawings when I was a kid. I also liked to draw robots in caves, with elevator shafts and I typically drew the flashing top on them as well. My robots did a lot of excavating and mining. My son is only two now, it'll be a few years before he's drawing robots (or whatever it is he'll be drawing). Our kids are so fortunate to have so many tools and toys available to them! Thanks for posting the drawings, tell your kids they're inspiring people around the world. That's great! i need to look into the Flash 5 for my boys, they love drawing robots and Melee. My 10 yr old uses Rhino Cad sometimes to make renderings of his drawings, but it's not animated, he'd love that! wonderful, clever kids. Future computer geeks (meant in the nicest possible way) no doubt..
Wow, now thats something pretty special there. I myself picked up photoshop when I was about twelve. Your sons have a lot of talent! Get them a book on Flash! And here comes their constructive criticism. Try using solid colors instead of radials for coloring! They might be interested on learning how to keyframe animate as well, a la Disney. I teach University level Flash. I wish some of my students still possessed this kind of imagination which seems to have abandoned them. Ah Ruku - constructive criticism requires an output to be constructive. Like Why use solids? This is a good example of constructive criticsm. I suspect unconstructive criticism is the partial cause of my mature students loosing contact with their imagination. You should introduce them to Digital Stop Motion Animation. You can use a web, video or Digicam to capture individual frames and then use a program like "stopmotion maker" to string the frames together into a movie. My boys a 6 yr old and 8 year old ( who is also an Autistic (PDD-NOS)) and I have a lot of fun with it. S.I.D, thanks for the suggestion. As it happens, my boys have also done stop-motion: Silliputtimation.